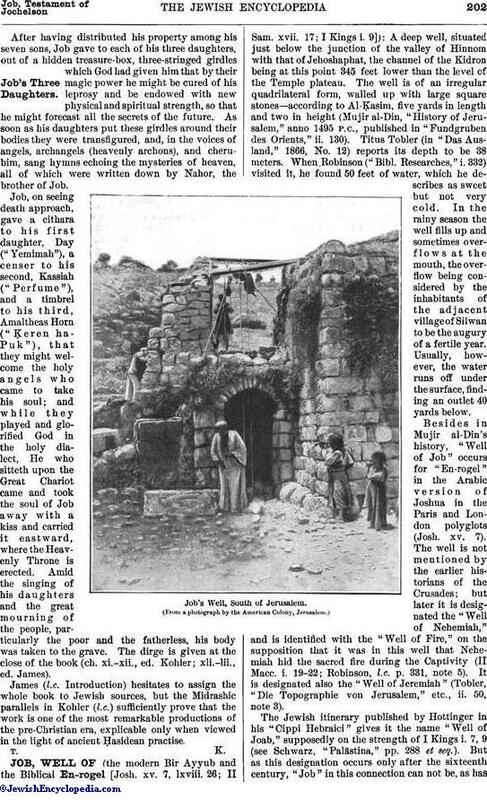 A deep well, situated just below the junction of the valley of Hinnom with that of Jehoshaphat, the channel of the Kidron being at this point 345 feet lower than the level of the Temple plateau. The well is of an irregular quadrilateral form, walled up with large square stones—according to Al-Ḳasim, five yards in length and two in height (Mujir al-Din, "History of Jerusalem," anno 1495 P.C., published in "Fundgruben des Orients," ii. 130). Titus Tobler (in "Das Ausland," 1866, No. 12) reports its depth to be 38 meters. When Robinson ("Bibl. Researches," i. 332) visited it, he found 50 feet of water, which he describes as sweet but not very cold. 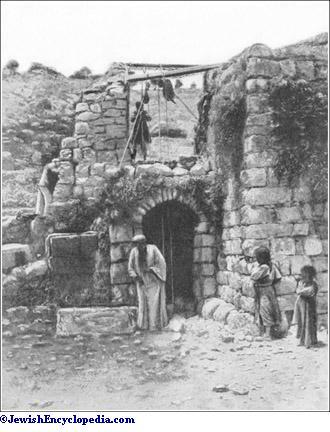 In the rainy season the well fills up and sometimes overflows at the mouth, the overflow being considered by the inhabitants of the adjacent village of Silwan to be the augury of a fertile year. Usually, however, the water runs off under the surface, finding an outlet 40 yards below. Besides in Mujir al-Din's history, "Well of Job" occurs for "En-rogel" in the Arabic version of Joshua in the Paris and London polyglots (Josh. xv. 7). The well is not mentioned by the earlier historians of the Crusades; but later it is designated the "Well of Nehemiah," and is identified with the "Well of Fire," on the supposition that it was in this well that Nehemiah hid the sacred fire during the Captivity (II Macc. i. 19-22; Robinson, l.c. p. 331, note 5). It is designated also the "Well of Jeremiah" (Tobler, "Die Topographie von Jerusalem," etc., ii. 50, note 3). Job's Well, South of Jerusalem. The Jewish itinerary published by Hottinger in his "Cippi Hebraici" gives it the name "Well of Joab," supposedly on the strength of I Kings i. 7, 9 (see Schwarz, "Palästina," pp. 288 et seq.). But as this designation occurs only after the sixteenth century, "Job" in this connection can not be, as hasbeen suggested, a corruption of "Joab," the reverse being true. 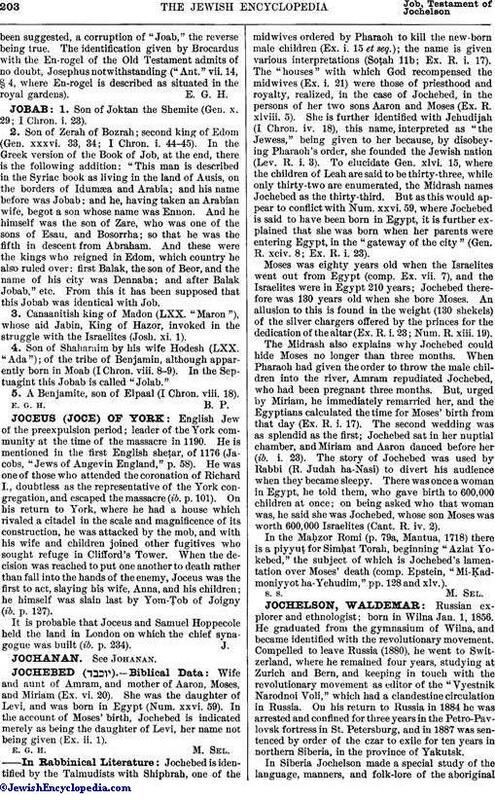 The identification given by Brocardus with the En-rogel of the Old Testament admits of no doubt, Josephus notwithstanding ("Ant." vii. 14, § 4, where En-rogel is described as situated in the royal gardens).